For most people, a simple definition of a crisis is “the moment my brain stops functioning.” Your brain evolved in layers. The first, primitive, layer is your “fish brain”, the next, mammalian layer, is the “dog brain”, and finally you have the frontal lobes, which we know as your “human brain”. Depending on how stressful you find a crisis, the first to stop is your ‘human brain’, impacting thinking and reflection. Your ‘dog brain’ takes over, wanting to retaliate and bite. And in a crisis where you feel you have no understanding or control of the outcome, you can enter the ‘fish brain’ state, which knows only to flee from danger. To solve a crisis, you need to be in control at a personal level. You need what was first described in the 1950s as ‘internal locus of control’. People attribute their chances of success or failure either to internal or external causes. Those with an internal locus of control hold themselves responsible for the outcomes of their actions. Most successful people possess an internal locus of control. Those with external locus of control blame circumstances or luck, and see themselves as victims. People with internal locus of control still experience negative emotions: fear, sadness, agony, contempt, disgust or shame – it’s only human, and a healthy reaction to crisis situations. But these may produce negative behaviour counter-productive to your success – and you do have control over your own behaviour. 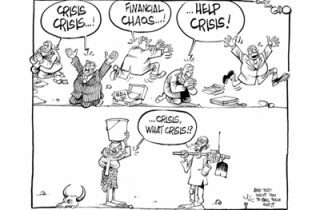 What can you do in a crisis? When you focus on what you can directly influence, you feel motivated, positive and able to deal with things – you’re showing you can lead in a crisis. What is in your circle of influence? At the very least, your thoughts, mood, actions, decisions and communication with others. Focus on these things first. When you focus on your ‘circle of concern’, which you have no influence over – the state of the economy, pronouncements of the media, and so on, you get demoralised and find it difficult to have the enthusiasm to do anything. If you really believe you’re operating in a crisis, you’ll only have three options: fight, freeze or flee! In Buddhism they say, “don’t just do something, sit there!” – an interesting point. Remain still until you have a grip of what you are facing. Explore and challenge your perceptions and what is really in your circle of influence. Remember if you do nothing that others around you may perceive you as being passive, even though you have made a reflective choice. If you choose to ‘freeze frame’, let people know what you’re doing and give them a timeline. Can you leave a crisis situation and still be regarded as responsible, not as having ‘fled’? If the situation is a lost cause or you can’t do something productive, an exit is a good option. However, communicate this to people concerned. Remember it’s easy to lose friends – and you’ll need your friends’ and colleagues’ support to stay the course. Are you experiencing tough times? Even when we’re experiencing a crisis – whether economic, business or personal in nature – it’s good to remember that people get through those difficult times. Some have even been shown to challenge their own perceptions and beliefs and do the work they need to do to stay in control – of themselves! Keep calm and handle your crisis!